I really can never ever get enough of donuts. What’s wrong with me? Does anyone else suffer this addiction of sweet fluffy dough and glaze? That was my conscience trying to convince my hips. I had to find something to do with all of the lemonbalm growing in my yard. There is so dang much, that I just assumed it was one of my 10 varieties of mint choking everything in sight. Then when I went to rip some of it out, the scent of lemon was heavy in the air, and it was so refreshing. I couldn’t help but make something out of it. And the yogurt makes them beyond moist and incredibly tender. 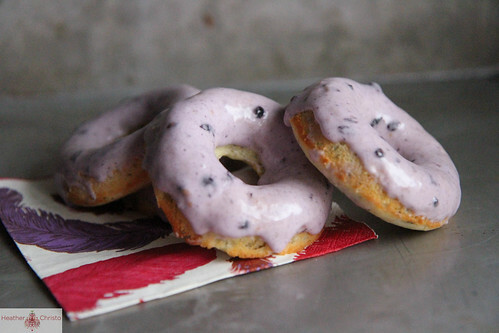 However it is the crazy blackberry glaze that makes these so wonderful. PLEASE TRY THEM!!! You make these by mixing together the flour, sugar, baking powder and salt in a bowl. 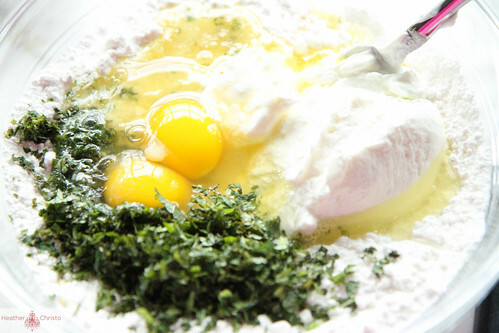 Add the melted butter, lemon balm, yogurt, milk and eggs. Combine well until you have a smooth batter. 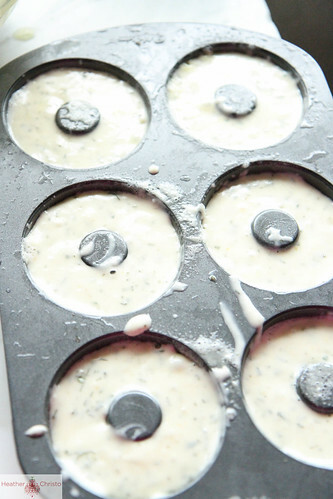 Fill the donut pan with the batter and bake the donuts for 10 minutes. Remove from the oven and let cool for a minute before turning out onto a cooling rack. 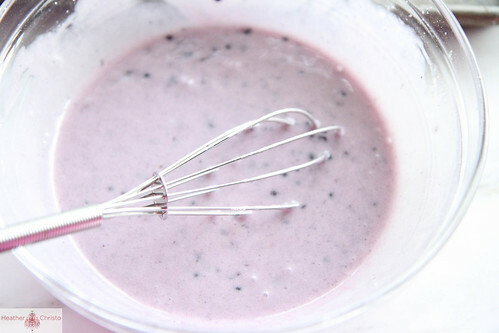 Mix all of the ingredients together in a bowl and whisk until smooth. 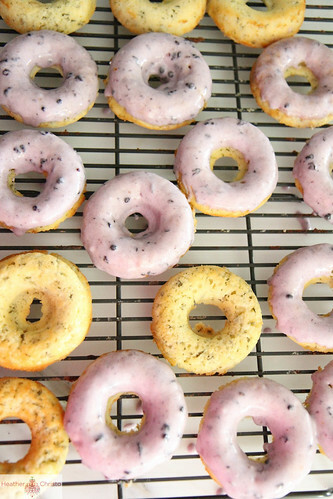 Dip all of the donuts up to two times until they have a thick coating on them. Let them sit until the glaze is firmed up. Enjoy! 2. Preheat the oven to 325 degrees and prepare a donut pan with baking spray. 3. 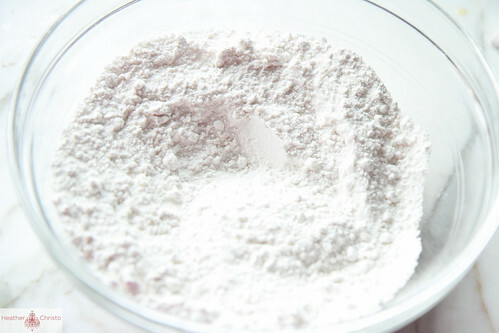 In a large bowl, mix together the flour, sugar, baking powder and salt. 4. 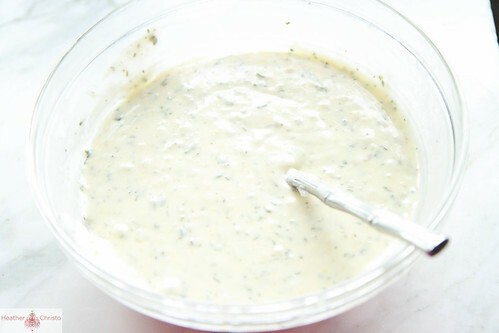 Add the melted butter, lemon balm, yogurt, milk and eggs. 5. Combine well until you have a smooth batter. 6. Fill the donut pan with the batter and bake the donuts for 10 minutes. 7. Remove from the oven and let cool for a minute before turning out onto a cooling rack. 9. 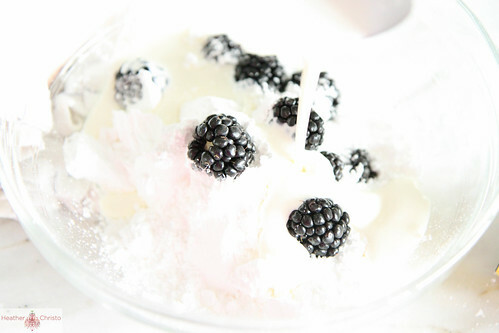 Mix all of the ingredients together in a bowl and whisk until smooth. 10. 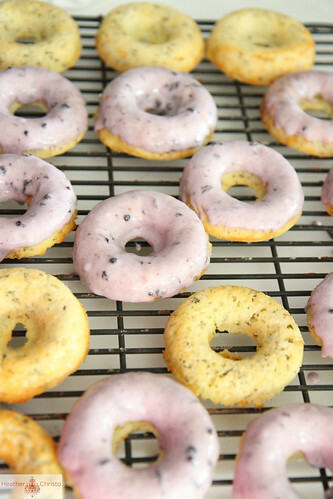 Dip all of the donuts up to two times until they have a thick coating on them. 11. Let them sit until the glaze is firmed up. Enjoy! Just stop it!! I can’t handle all these sugar-awesome posts!!! Loooooove! Holy yum! 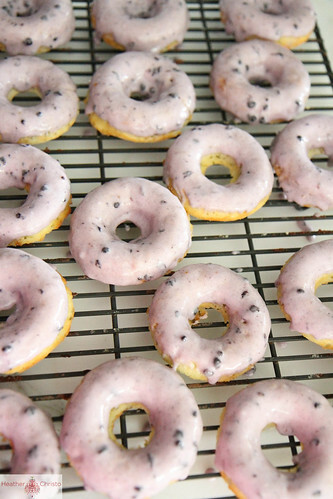 I need to make doughnuts this weekend! lol! Yes! donuts are always appropriate on the weekend! 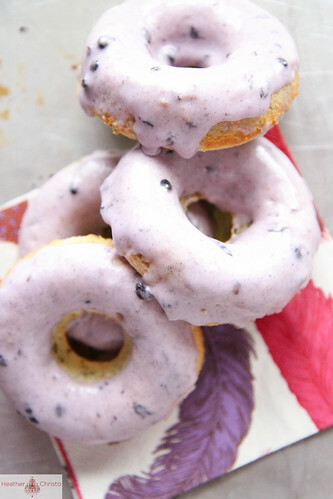 Oh, I’m definitely making these “healthy” donuts! I can’t believe how easy your instructions are. They look so delicious. Can lemon balm be used to infuse oil? I am sure it could be. I should look into how to do that, although I suspect you have to refrigerate it afterwards? DO you know much about infusing oils Vicki? I love your donut recipes! What is the brand of donut pan you use? I would love to purchase one, so that I can make these! Thanks Tambi! The brand is Wilton, and they are sold at lots of kitchen stores and everywhere on-line. This is such a crazy good inventive recipe. I love it when people choose to use less mainstream garden plants like lemon balm in their cooking. Nasturtiums, daylillies, anise hyssop, marigolds and even tuberous begonias are edible! How coold is that? Heather~Love All your recipes, ideas and blogs.. Found you on tasty kitchen first and have tried several of your recipes and all of them are wonderful. 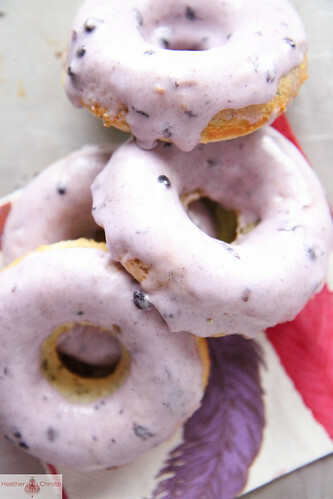 Love this doughnut recipe~can’t wait to try. I have never heard of Lemon Balm , is there a substitue for this? Thank you Ronda!! Yes- just go ahead and use some fresh lemon zest or even some fresh mint would probably be good! OK Heather these have gotta be the most gourmet + fabulous donuts I have ever seen. Me want now. Oh! Thanks so much Marla!! Girl! I am with you. I can’t get enough doughnuts either. These look phenomenal. Love the color of these donuts! I can almost taste these Heather!! I’ve been looking for a new little “bread item” to make for work… so guess what I’m making this weekend??? the color of these dougnuts knock my socks off! simply gorgeous, Heather! Thanks Susan! That is definitely my favorite part about them! Now I finally know what to do with the ACRES of lemon balm growing in my garden! It makes a lovely cocktail, but this, this is genius! Can’t wait to try it!! I just adore that lemon and blueberry combination. Lovely. I just did a review of these on my blog! I couldn’t find lemon balm so I replaced it with lemon thyme- and they came out great! Thanks for the idea! I would like to make these, can i substitute corn syrup for maple in a glaze? Sure! I use the touch of corn syrup to give them that shiny elastic glaze, but feel free to try maple! October 8, 2013 at 10:07 am	 Lora D.
These look delicious! 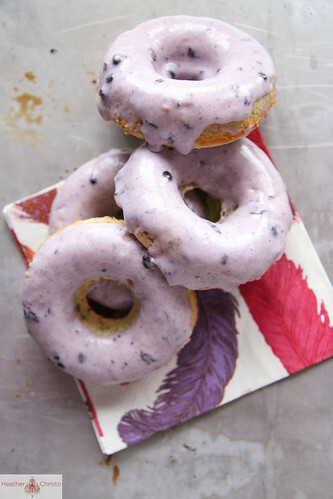 Love the purple glaze but do the blackberry seeds in the glaze get annoying? That’s because donuts are really yummy. I would’ve had too much of it too if I was there looking that it. LOL. Beautiful donuts, love your pictures! I just made them but I have a couple questions. I followed your recipe to the ‘t’, but my batter is was thicker than yours. And I only ended up with one dozen! Your pan look the same as mine, you aren’t using the mini-donut pan, right? Thanks!! Love the lemon balm!